Sleeping is the most important part of our life. It is the only time when we give relief to our body and take rest. I can't tell you how important it is for our life. I have heard to many people how exhausted they are for a solid night sleep. It has said that "sleep well get health" it has a lot of benefits, here i am going to share shocking health benefits of sleep. In many articles related to night's sleep I have seen that adults of ages 18-45 should take sleep at least 8 hours. But if you sleep at 2 am and wake up at 10 am will not be in tip top shape and definitely as compare to sleep at 10 pm to 6 am. 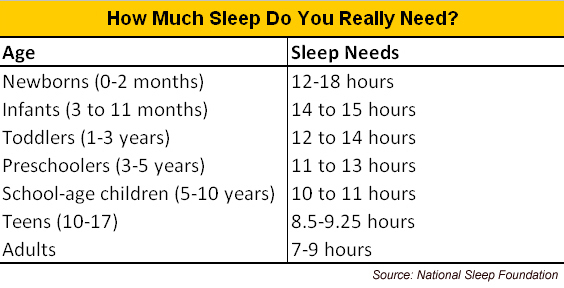 check out this picture, how much sleep you really need. Sleep make you feel better. Scientist have gone high lengths to fully understand sleep's benefits. Here I am going to share it's shocking health benefits. 1. Creativity, it make u more creative. It has been prove that those who sleep well are more creative than those who don't. 2. A solid night's sleep help to reduce the chances of disease such as heart diseases, strokes, diabetes, aritrities etc. 3. It also improve your memory. It has proved that " when you're trying to learn something new, you mind can combine what you're attempting to learn while you're sleeping"
4. A good sleep also keep you away from daily stress, tensions etc. It has also proved that those who take enough sleep feel fantastic when they wake up. 5. I also make you look attractive. Regular shut-eye not only make you look healthier but attractive too and it has proved in 2010 researchers take photos of people and those people who take enough sleep score more as being more attractive. 6. your attention span also increases, you will notice that nowadays children look active while adults look tired and woozy it's just because of lack of night's sleep. 7. It is also great to maintain good health, the part of our brain control sleep also connection with metabolism system. So when you feel sleepy your brain tell you to eat and get pack of pounds. great post keep it up.